Two terror attacks this week carried out by pathetic, Godless cowards. One was quickly and strongly condemned by the US President, the other was reluctantly and half-heartedly “condemned”. One was Islamist inspired. The other was home-grown, white supremacist inspired. The following bible quote reveals the inspiration behind their cowardly acts (as well as the source of so much of Trump’s rhetoric). Trump Swiftly Condemns Barcelona Terror Attack. Charlottesville? Not So Much. He then promoted a fake story about mass murdering Muslims. 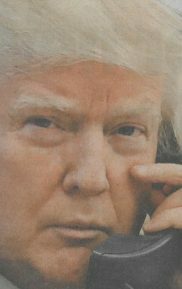 With pertinent details still unfolding, President Donald Trump took to Twitter Thursday afternoon to condemn a terrorist attack in Barcelona, where a white van plowed through the popular tourist street of Las Ramblas, killing at least 13 people and injuring more than 50 people. The president’s response to the Barcelona attack was far swifter than his delayed response to the white supremacist clashes in Charlottesville, Virginia on Saturday and his initial failure to flatly denounce white nationalists. Instead, Trump blamed “many sides” for the violence. Trump later followed up his condemnation Thursday with a second tweet that perhaps explains why the president was so quick to react to Barcelona and not Charlottesville. It should be noted that the story he cites below is fake. Britain: Brexit, Theresa May and a hung Parliament. In Australia, partisan politics continues to cripple a government that often seems to have more policy disagreements within its own ranks than it has with the official opposition party. France: power to be in the hands of a new, untested, quickly cobbled together party based on the charisma of a young leader. Can such a party provide longstanding stable government? German elections in September… what surprises could that bring? Some religious commentators are attributing the increasing instabilities in the “Western World” to a departure from our historical Judeo-Christian foundations; but I find their view of history is seriously flawed. What kind of “Judeo-Christian” foundation was “Western democracy” ever built upon? Has there ever (REALLY) been an all-encompassing embracing of Jesus or His gospel? Over over centuries there was a lot of religious superstition, theological rhetoric, and political USE of the Church as a tool of government. And while there may have been individual pockets of society that at times have shown authentic devotion to God, has there ever been a GENUINE widespread, long-lasting commitment to Jesus and His Kingdom that could result in a claimed blessing of “the West” over past centuries – blessings that are now allegedly being forfeited? If anything, it seems to me that during the period AFTER the claimed abandonment of Judeo-Christian ideals, the west experienced its most peaceful and prosperous period: that is post WWII. Of course there were ongoing problems, but arguably, things had never previously been better for the average person in the west as the world got back to its feet after the death and destruction of the Second World War. It’s mostly in the last decade or two (significantly post 9/11) that perceived threats have led to growing fear that blessings (our comforts, safety and wealth) will be forfeited due to a casting aside of Judeo-Christian” ideals. (Proffered evidence of this casting aside can date back a century or two. One case I’ve seen points way back to the French Revolution* as an example!). Those fears of loss at the heart of the argument seem mostly founded on a fear of others – those “not of the west” . A fear that others coming into our nations will disrupt and compromise our “western values” – values that to a great part are not necessarily Kingdom values anyway. Apart from the current issue of promoting a fear-based ideology, the fictionalising of history projects the cause of perceived problems onto society at large, putting the blame on “THEM” and THEIR (society’s) relationship to God; shifting the focus away from the personal and our own relationships with God and the unbelieving society we live among. Over the past 15 years or so, I believe the Lord has made me aware of three serious areas of deception affecting the church. They are not the ONLY examples, but they are the beliefs and attitudes that I’ve personally experienced or observed close-up. The extremes of Charismania and its associated beliefs and practices. The misguided understanding of God and the gospel promoted through Calvinism. The first two have been the subject of many of my posts in the past, and I’ve also addressed the third to various degrees on a few occasions. At the moment I see that third has become the most pressing problem – embracing adherents from across the Christian spectrum. And that third example is no less vociferously defended by its adherents than those who hold to the other two. I’ve seen and heard many professing believers express pride in their nations and their citizenship, and I’ve heard them justifying that pride and their right to have that pride. But if you are one of those proud citizens, have you REALLY taken the time to examine what you are taking pride in? Have you looked at the history and the foundations of your nation? And I mean the REAL history, and not some mythical version of it. Have you looked into its wars, its invasions, its mistreatment and abuses, its murders. Have you looked into the things your nation values? Have you looked into its origins and how it built up its “prosperity” and how you came to share in that prosperity (as small as that share may be). Have you looked at how your nation has treated the least of its citizens – or those it excludes from citizenship? Can you REALLY be proud of your association with ALL of those things? Do you think those things would be approved by Jesus? One justification I’ve heard for a person’s patriotism is that their nation has done more to spread the gospel than any other. But even if we take that gospel-preaching claim at face value – was it REALLY your secular nation at work and therefore deserving credit and your “pride”? Or was the gospel being spread by CHRISTIANS who happen to live in your nation. Spread by citizens of the Kingdom of God, sojourners, strangers, people not belonging to this world and its Kingdoms. Ambassadors of Christ, representing Him in foreign territory. To whom or what do you give your allegiance, your devotion, your service? What are the priorities and practices of man’s nationalistic politics and where does YOUR heart lie? Has God not chosen the poor of this world to be rich in faith and heirs of the kingdom which He promised to those who love Him? But you have dishonored the poor man. Do not the rich oppress you and drag you into the courts? Do they not blaspheme that noble name by which you are called? Making [ your nation ] Great Again? Then the devil, taking Him up on a high mountain, showed Him all the kingdoms of the world in a moment of time. And the devil said to Him, “All this authority I will give You, and their glory; for this has been delivered to me, and I give it to whomever I wish. Therefore, if You will fall down and worship me, all will be Yours”. Fact check: what did Trump’s tweets about Obama’s ‘wiretaps’ mean? accused former president Barack Obama of illegal wiretapping. Using Twitter, the president also mounted a defense of his attorney general, Jeff Sessions and his meetings with the Russian ambassador. The six tweets appeared to originate with rumors circulating in rightwing media, especially talk radio and Breitbart News – recently run by Steve Bannon, now the president’s chief strategist – about a “silent coup” against Trump, by members of the Obama administration.